And as for the VAL0900: DIY Self Cutting Valve ....... as above ........... took my time reading the instructions ....... turned water off ...... installed with easy .... water back on ...... job done in 5 minutes .... I would advise anybody looking to buy a cheap alternative to think again ....... quality pays in the end. This is a good quality product &, with the following caveat, easy to use. I found it easy to fit the collar around the pipe but when I started to screw in the valve body I misinterpreted the resistance I met as being caused by the very snug fitting rubber washer. In fact I had cross-threaded the valve. I managed to sort this out by re-tapping the thread in the collar & replaced the collar on the pipe with the valve already partly screwed in. After that it worked like a dream, no leaks even on first cutting through the pipe. OK. I might just be clumsy but watch out! 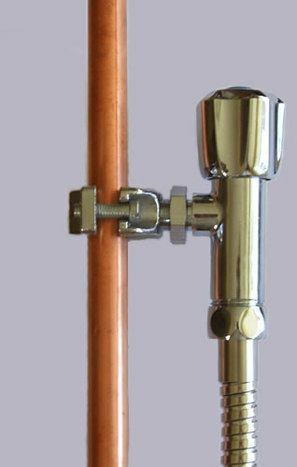 DIY sef cutting isolating valve, clamps directly round any standard 15mm copper water pipe, piercing the pipe to provide controlled water flow to your appliance. Simple to fit by yourself, avoiding the need for costly plumbers. To view larger images and additional information, click on the image to the left which will the load main page where more detailed information is available. 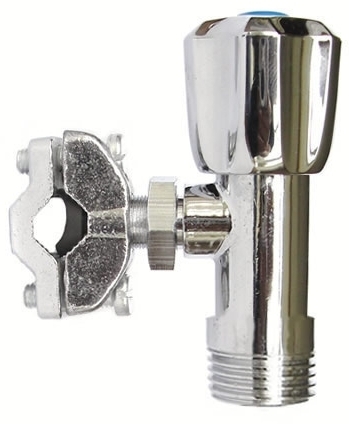 Self cuuting valve, enable you to quickly tap in to a standard 15mm water supply. The valve comes with a standard 1/2" BSP shower hose connection. Please click HERE to view or print our step by step fitting guide Self cutting valve installation guide.